Situated in an idylic rural setting to the north east of Doncaster. Just minutes away from Junction 4 of the M18 or Junction 34 of the M62. We welcome visits but please ring/message before hand to check that we are available to avoid disappointment. I have been involved with equines since I was two years old loving the thrill of riding from that early age when, as a treat on an Easter day out by the seaside, I was allowed a donkey ride. Following the winter it was the donkeys first working day of the season and being in high spirits the one I was allocated ran off with me along Cleethorpes beach. I managed to stay on board with dad chasing after me. Once the donkey was caught the attendant asked if I would like another ride as compensation. I eagerly accepted, apparently, and have been hooked on all things equine since. Eventually I saved enough money to buy my first horse. He was a four year old skewbald cob gelding of great character and mischievousness, called Scooby. Further purchases of Peggy, a skewbald cob mare, and Chieftain a piebald cob gelding followed. Scooby died peacefully in his sleep at the grand age of thirty years and three months. Chieftain and Peggy are now enjoying their retirement in their own paddock. 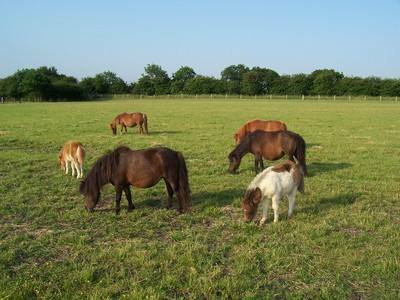 Following the decision to 'downsize' (in hands) in 2002 Sheribrooke Miniature Shetlands was established. Initially I purchased a mare in foal, who shortly afterwards presented me with a beautiful bay filly foal. At the same time I bought a mare which had been covered to foal the following year and she produced a stunning skewbald colt - Sheribrooke Benjamin. I soon purchased a quality piebald stallion and some more mares all with excellent pedigrees behind them. They now produce excellent home bred stock, which have included Sheribrooke Dougal, my homebred licensed skewbald stallion. 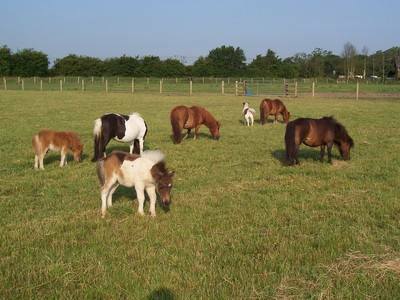 The future of the stud lies in breeding quality ponies of piebalds, skewbalds of more unusual colouring, palominos, chestnuts (with flaxen manes and tails) and duns.